Today is 7 May which means it’s been just more than 7 months since we rocked up in Germany for our little sojourn in Europe. 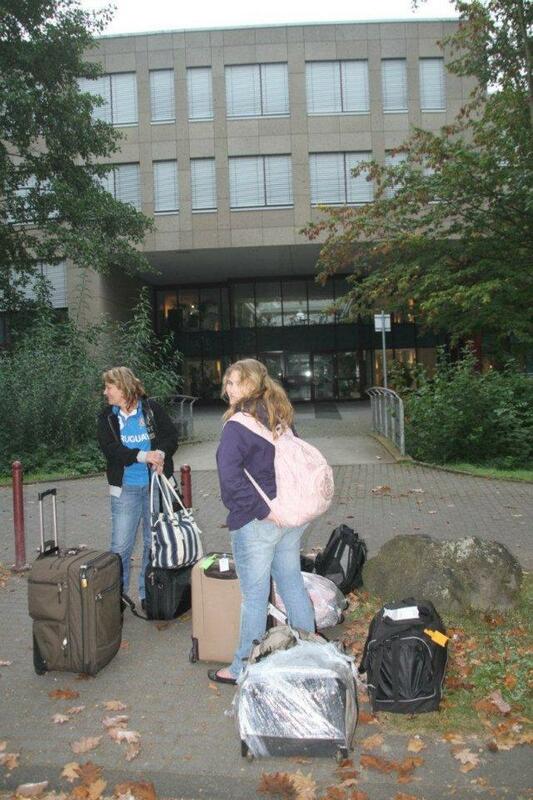 That lost feeling being dropped off in front of an office block in Ramersdorf, Bonn in which we would occupy the little two-bedroomed flat while we search for a house is now long gone. We still are none the wiser as to how long we will stay and what exactly is going to prompt our return to South Africa, but we are now settled in and understand many aspects of our new reality so much better. Well, for starters, I can by now at least treat my immediate family to a proper ‘braai’, though I will have to elaborate on my meaning with ‘proper braai’ at a later stage. I have also learned that using the ‘www’ actually does mean precisely that; ‘world wide’, and that my stuff will be accessed from anywhere in the world. I started my blog sort of on demand from two friends in South Africa to keep the folks back home up to speed with what we are doing in Europe, but now realised that I have gained a slightly wider audience. Thus, I need to explain my blog name and some references to provide that little bit of context! ‘Aldiepaaie’ can be translated directly to ‘al the roads’, but doing that, you will surely not understand the essence of what this is about. 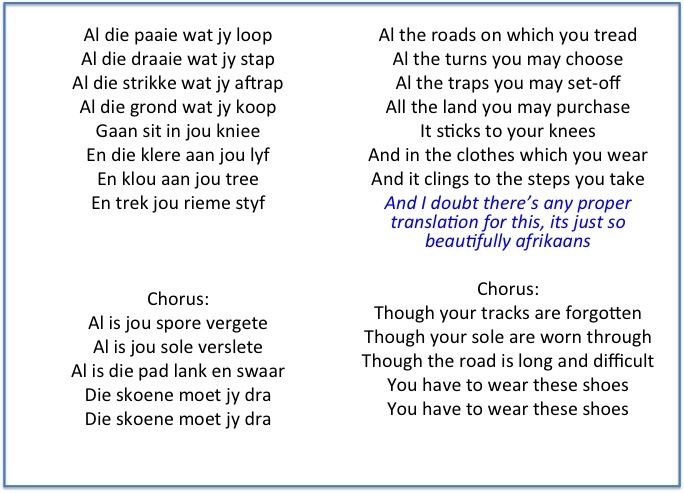 One of my favourite South African musicians, Valiant Swart has a song ‘Die skoene moet jy dra’ (You’ll have to where the shoes) that inspired me using ‘Aldiepaaie’ for my blog name. That Valiant song captures the essence of what Heleen and I decided and understood when we made our decision to pack-up and go venture somewhere new and challenging. That song is just such a good song, I love it. Please just note that the translation is an effort to bring the message over, not at all a translation to translate the feel of the song. For your convenience, listen to the song at youtube though the video is obviously a private affair. I hope that all my non-Afrikaans, and for that matter then all my not-so-Valiant-savvy Afrikaans friends understands the meaning and context of ‘Aldiepaaie’, because you too must ‘wear those shoes’ in your own lives. While I’m on the topic, I often refer to songs, movies or quotes, and obviously often with Afrikaans undertone. You as reader should never hesitate to ask the meaning or connection, that’s why I allow you to comment! OK, now that I’ve done the admin, let’s talk German(y). To my shame and probably Hanno’s fury, the German language is the one thing I have not given the deserved attention so far and though we do OK with day to day shopping, ordering and so on, I cannot speak nor understand German yet. To all those wise cracks out there who thinks that by talking slow Afrikaans (Samantha) you can manage in Germany, its simply not true. Firstly, very few common Germans know of a language called Afrikaans. Thus, when they do hear us speaking Afrikaans, there is obviously no context and their first take is that we’re speaking Dutch or some Scandinavian language. While in Holland its much easier with the Afrikaans the Dutch tend to answer back in either German or English when we do speak Afrikaans to them. They obviously do not enjoy our ‘very poor attempt at Dutch’. My excuse on that is that Dutch is simply ‘old afrikaans’, the way my grand grand parents spoke! However, for me its very exciting to be able to follow most of the Dutch being spoken. Stean wisely recommended that in Holland we should just speak Afrikaans by substituting the ‘s’ with ‘sch’ and adding ‘g’, as in ‘Pgaat net scho’ and it will suffice. But slow Afrikaans in Germany? Simply not true! 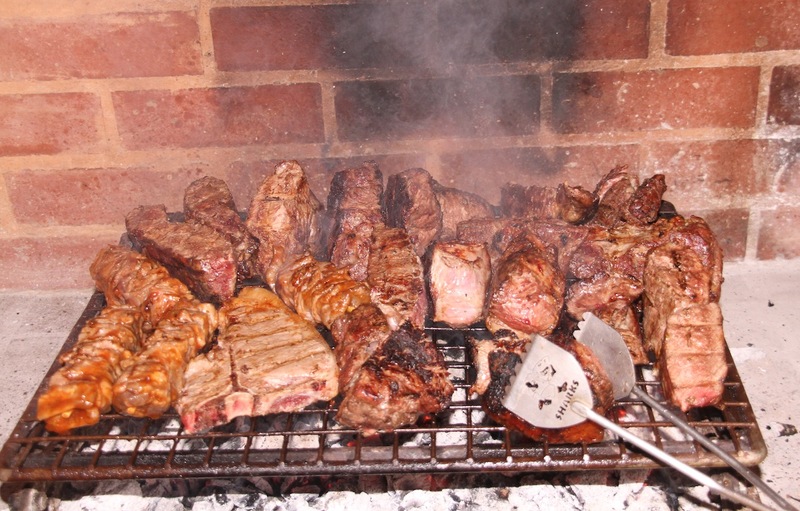 After our holiday in Argentina last July, I did proclaim to the guys back home in South Africa that they are not the braai kings anymore; I have tasted ‘bife de chorizo’ and sorry Boere, that was good. However, a braai is not just the food on your plate, but rather the event. And this is where the South Africans are still on tops. It starts with the choice of meat and wood (the ladies might add salad, ‘pap’, ‘braaibroodjies’ or potato dish as well, but that’s just side dishes) and gets momentum when the (wood) fire is lit, the wine poured, the playlist selected and the conversation started. It ends long after that and not when you put your knife and fork down on the empty plate. Even in South African there are people who think a braai is a dish, rather than an event. In both the pure taste of the meat and the event of the braai it is simply falling short in Germany. But then, we are not in Germany to have first class braais (for the wider audience, braai = barbeque aka barbie in some places). We are in Germany for a bigger picture reason. So, after seven months, what is it that I enjoy the most? First must still be the travel, explore, see, photograph and learn of new places, people, history, infrastructure and culture. Though I do realise that we have normal responsibilities such as school and homework with the kids, we are living such a ‘less complicated life’ at the moment. We have already learned that life is not necessarily a 40-year slog until retirement and then 10 years enjoyment before your knees catch up with you. We are also starting to become part of the community at the APC (church) in Bonn, which adds a further interesting exposure to our experience and which is a hugely pleasurable one indeed. Due to the diverse nature of an English-speaking congregation in Germany, it’s a true enjoyable affair to slot into this Christian community. One of the reasons we embarked on this ‘adventure’ was specifically to challenge our comfort zones and to experience change, thus it is rather comforting to experience this uncomfortable change, if you know what I mean? And obviously there are things that I miss and long for. Probably the biggest miss currently for me is my ‘stoep’ (‘large nice cosy entertaining with-fire-place/braai patio’ best describes my stoep) and ‘kuiermense’ (regular visitors) back home. Heleen and I love(d) to entertain our family and friends and even on very short invitations could get people onto our ‘stoep’ for ‘kuiers’. Google translate can only give me visit as English for ‘kuier’, but as with ‘braai’, the Afrikaans meaning is so much more than just the word. It is an all-inclusive meaning that includes chat, wine, music, sometimes even snooze off and eating, to name but a few. And that is the one thing I miss at the moment. Ups and downs, pros and cons and for or against are all opposites that will always be asked and thrown at you when you make big changes in your life, such as go live abroad for a while. I am however still very satisfied that we are on track with our original intent and purpose namely to experience something new. I still believe that we have an opportunity of a lifetime in our hands, and though so many comfort zones have been challenged and paradigms shifted, so many new views, experiences and even opportunities have been banked. We are still on course, which will include a summer camping trip to Spain. And we’re riding the ride.